I have quite a few super serious posts in my drafts folder, but I’m just not feeling it today. (If you’d like to see my opinion summed up in the words of others you should check out Mattie’s post and Steph’s post!) Instead of ranting about real world issues I’m going to focus on the make-believe world of film. Join me, won’t you? I think 2016 is going to bring us some incredible blockbusters (and a few indie gems). Here are the movies I’m most looking forward to! I love super hero movies, but I’m so far behind with The Avengers (read: I’ve never seen any of them except Cpt. America). The opposite can be said for X-Men. I love these movies- the old ones and the newer ones. I can’t wait for this film to come out! When the first film came out I wrote the date in my planner a year ahead of time, bought tickets for the midnight premier, and forced K to go with me. I was disappointed. Honestly, I don’t like what Tim Burton’s done to the classic… It was just the right amount of weird without Burton’s psychedelic colors. But I am an Alice fan through-and-through so I will give this one a chance. I just saw the previews for this one yesterday. It looks hysterical. You can watch the preview here. I have never seen a TV-episode of Star Trek, but I am so in love with the new films. (The first one is my favorite.) I love the chemistry between with cast and there’s a delicate, perfect balance of humor and action in these films. We had a viewing party when the second one came out- maybe we can do that with this film, too! It’s no secret that I love kids movies. (Here’s my review of Zootopia!) I also love my dogs. So logically I think this movie looks so cute and funny! I had no idea this movie was in the works until I started browsing 2016 releases. I love films about real people- and this one is directed by the same guy that did The Blind Side (which I LOVE). And Michael Keaton is one of my favorites. Plus, I have no idea about the history of McDonald’s so this movie seems really interesting! What kind of Potterhead would I be if I didn’t include this film?? Actually, in all honesty, I’ve never read the book that this film is based on… Fortunately the film isn’t out until November so I have plenty of time! And there’s my attempt at keeping things light and airy on this glorious Wednesday. (HOW IS IT ONLY WEDNESDAY!?) What movies are you looking forward to seeing this year? I’m going to see Ghostbusters…but to be honest with you I’m not sold on it so I’m keeping my expectations low. I also want to see Bad Moms! We just saw Sing Street movie by the same director as Once and it was great! I totally recommend it if it’s in a theatre near you! I’ve never heard of that movie! I’ll have to check it out! I’m really really hoping Ghostbusters is amazing; I love all the ladies that are starring in it! I am SO EXCITED for Bad Moms and Ghostbusters! I am not a huge movie goer anymore but Bad Moms looks awesome. I will see Ghostbusters at some point too. My husband will definitely not enjoy Bad Moms (except for the actresses *eye roll*) so I think I’m going to have to find some girl friends to go with, haha! I am always so giddy for anything X-men related. Every time the preview is played in theaters, i’m sitting WIDE EYED. I KNEW I could count on you to be pumped about X-men. I serious cannot wait!!! J-Law looks like such a bada$$!!! I’m psyched for fantastic beasts, I haven’t read the book yet either. I’m glad I’m not the only one 🙂 I’m curious to discover the storyline- I didn’t think the book provided enough of a foundation for three movies…. but I guess we’ll see! 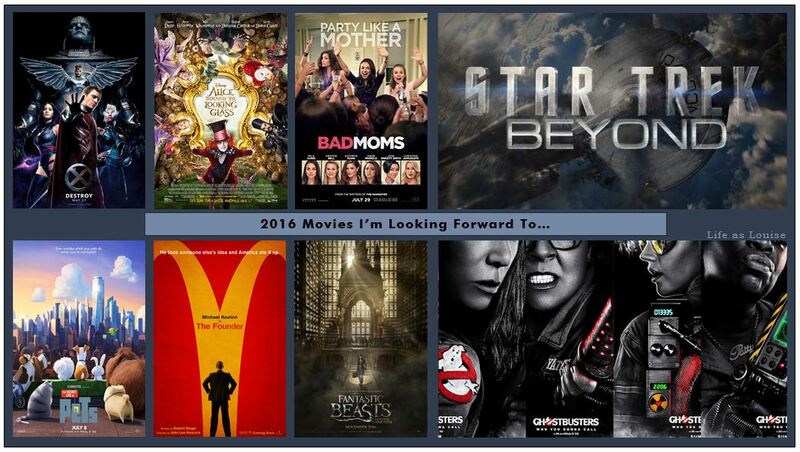 Definitely looking forward to Ghostbusters and Bad Moms. I love all of those funny ladies! Masterminds looks interesting, but I’ll probably wait for it to come to Netflix. Also that one with Julia Roberts and George Clooney looks interesting, but I forget what it’s called right now! I think that the actresses are really going to make those movies great! Are you talking about the one where Clooney is on TV and the guy comes onto his show with a bomb vest? I think that one looks really good, too- although I’ll be SO anxious watching it! Haha! Ha! Those are such opposite movies! Haha! I think Suicide Squad looks awesome- but the DC Comic movies are always SO dark and violent. Haha. I still haven’t decided if I want to see it yet. Thanks, Emma! I think I’ll end up watching a lot of these once they hit Netflix or DVD on weekends that K is away 🙂 He doesn’t find humor in all the things I do. Haha! So behind the times over here. I’m not really sure what the Fantastic Beasts movie is (I did just Google it though) so now that’s on my list. Hadn’t heard of Founder, now on my list. Desperately need to see The Secret Life of Pets and Ghostbusters (I haven’t seen the full first one either!!!!) and have only heard of Bad Moms just recently in passing but I feel like it will be hilarious so yes, please. Annnd I seriously hadn’t even heard of any of the four at the bottom of the list!!! Thanks for the shoutout! And now that Donald Trump is the official Republican candidate I could write a rant post to end all rant posts but after getting my one out, I think I’m done. 🙂 Hahaha! I was browsing a list of 2016 movie releases when I made this 😉 I think 75% of the list I came up with and the other quarter were films I found along the way! Haha! Oh man… Don’t get me started. When I heard Trump was the only one left I texted K and said, “Well, I guess we’re officially democrats now.” UGH. SO FRUSTRATING. Thanks, Lux! Me, too! I’m really curious to see what kind of story line they weave and how they stretch it through three movies! Haha! Haha I’m the opposite. I still haven’t seen all of the X-Men movies, but I love any and all Avengers movies. Well, Captain America 2 wasn’t my favorite, but still good. I have seen the last couple newest X-Men and I enjoy them. I felt the same way about the first Alice. I wasn’t a fan of Tim Burton’s take on it. I like some of his movies, but for me it didn’t work. It was a lot of visual but was missing something. But I do still want to see the new one. People are losing their mind over the Ghostbusters trailer, and I don’t care. I think it should be given a chance until we see the whole movie! I’m excited. Tim Burton doesn’t really do it for me… As an emo kid from the 2000s I should be burned at the stake for saying that. I LOVE love love Beetlejuice. And I love the Batman films he directed. But that’s it. I’m actually super excited to see Suicide Squad! It looks soooo violent, haha! (That’s my one and only hang up.) But I love that Harley Quinn is getting a story. And I think it looks really entertaining. It just looks super dark, ha. I still haven’t decided if I’m going to see it or not! Bad Moms looks SO funny! I think so, too!! And I just love Mila and Kristen!! Haha! I’m so bad about knowing when the film is coming out! I added dates for my own benefit to look back on and keep track. It seems like “Bad Moms” is a serious fan favorite! Haha!